Speaking as a person with a serious sweet tooth, maple syrup may be one of the greatest products of nature. It is tasty, versatile, and can be made by anyone with enough maple trees and a hot flame. It also has been a part of life in the upper Midwest for longer than many people realize. While evidence of prehistoric production has largely alluded archaeologists, archaeological and documentary evidence demonstrate the production of maple sugar foodstuffs by early historic Native American tribes in the 1700s, if not earlier (Thomas 2005; Thomas and Silbernagel 2003). Since that time, different people and different technologies have shaped the production process, as maple syrup and sugar became important foodstuffs across the country. While not quite centuries old, MSU also has a long history of working with maple products. This year, as part of our work for the Campus Archaeology Program, myself and Jack Biggs will be researching this history, as well as investigating an old, abandoned MSU sugarbush (a forest stand used for maple syrup production). 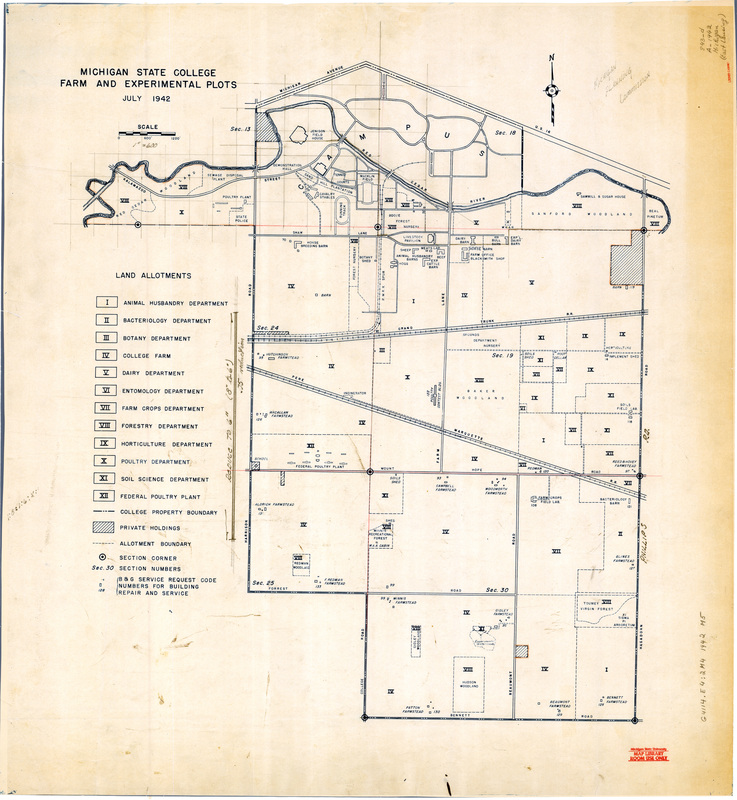 Interest in this project began with the finding of an old campus map from 1942 (http://archive.lib.msu.edu/maps/). 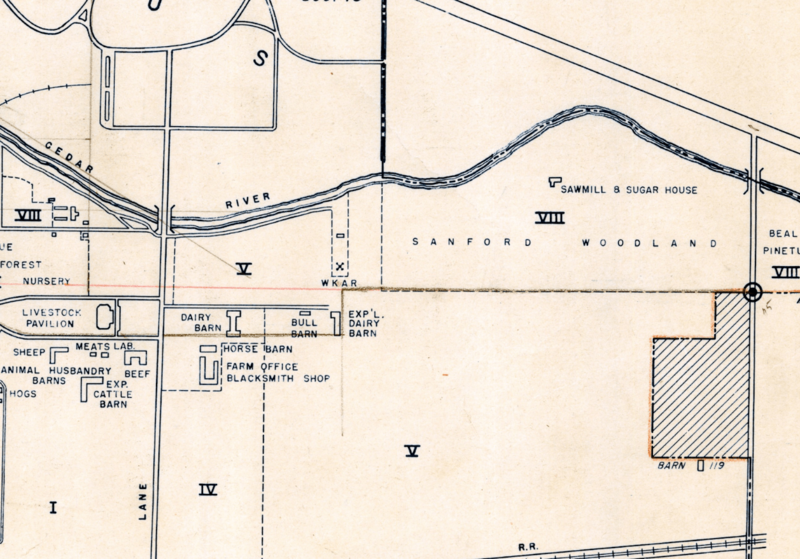 Located in the Sanford Woodlot, just north of the archaeology offices in McDonel Hall, was a small building, labeled the sawmill and sugar house, which few on the crew had realized existed. Later, during a leisurely walk in the woodlot, a CAP member noticed some building debris in the same general area where the sawmill and sugar house once stood, suggesting remains of the building still exist. This debris inspired us to research this building in our free time, and Jack and myself have subsequently gotten swept up in the history of this building, as well as the history of maple syrup production itself. While we still have much to discover, we know that sometime around 1915 the MSU Forestry Department began a maple syrup demonstration-research project, which involved the construction of a maple syrup production facility in the Sanford Woodlot. (https://www.canr.msu.edu/for/about/historical_timeline). 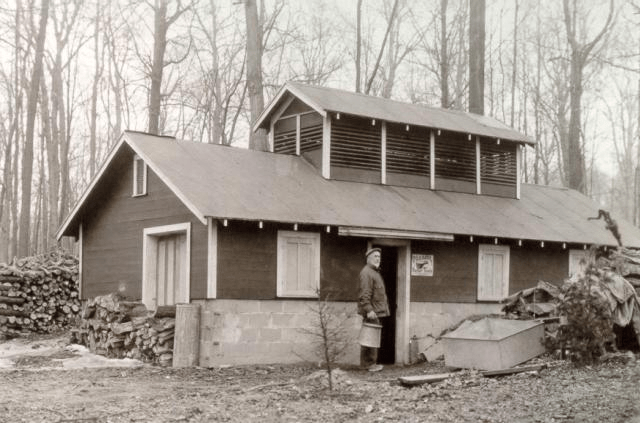 This project may have been part of a larger effort by the Forestry Department to encourage the standardization of maple syrup production and the use of quality standards (M.A.C. Record-Feb. 20, 1917). After around 10 years of production, it appears that the original sugar house suffered an unfortunate accident and burned down, joining a long list of MSU buildings that burned down during the early history of MSU (M.A.C. Record-April 27, 1925). The building was rebuilt in 1929 (M.A.C. Record-Feb. 1929) and production at this location continued into the 1960s, when production stopped and the building was apparently razed (Todd Wilson-https://msu.edu/~hvac/survey/1934Survey.html). Guiding our continuing research on this building is a long list of questions, including: Were both buildings constructed in the same area? What was the architecture like? Did the architecture/footprint of the building change after it was rebuilt? What technology was used for production and did they incorporate new technologies over time? Are there any intact archaeological deposits associated with the remains of the building? We also hope to work with other interested parties at the University to explore questions that they may have about this location and its use, all of which will allow us to better understand and manage this archaeological resource in the future. Stay tuned for updates throughout the year! 1917 M.A.C. Record, Feb. 20th, 1917. 1925 M.A.C. Record, April 27th, 1925. 1929 M.A.C. Record, Feb. 1929. 2005 Historic American Indian Maple Sugar and Syrup Production: Boiling Arches in Michigan and Wisconsin. Midcontinental Journal of Archaeology 30(2):299-326. 2003 The Evolution of a Maple Sugaring Landscape on Lake Superior’s Grand Island. Michigan Academician 35:135-158.